Darjeeling Limited is a road movie with three different protagonists, Owen Wilson, Adrien Brody and Jason Schwartzman, who we are told are brothers. One looks like a Hawk-nosed Italian (Adrien Brody) with fine features and a heavily pregnant wife he s left behind, the other a heavily bandaged German (Owen Wilson) on a spiritual trip to chaotic India and the other like a horny Tom Cruise (Jason Schwartzman) with a moustache and ever on the lookout for a quickie, whether it s in a hotel or a train. 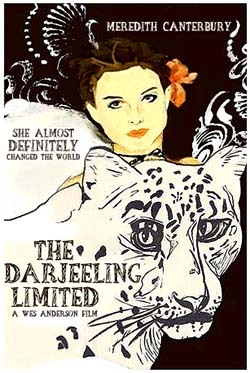 If you want to do a bit of sight-seeing in Darjeeling with its Chowrasta, the former Governer s House, Birch Hill, Windemere Hotel, the Mall, the Austrian-built ropeway ride to Singla tea estate, Tiger Hill and the Batasia Loop, you've boarded the wrong train. It s definitely not the Darjeeling Himalayan Railway with its toy train, and there s no Kanchenjunga in the background. Darjeeling Limited is a train that takes the three brothers to the dunes of Rajasthan, its colorful villages and towns and Punjab, with a lot of Sardarjis making their appearances but certainly not in the foothills of the Himalayas. The brothers are on their way to find their mother, who lives with Christians nuns who run a school somewhere in north-west India on top of a white-was-like building, reminiscent of the Moghul times. In other words the family structure is destroyed. The mother hadn't attended the funeral of her husband Mr. Whitman of Whitman Industries, who'd died two years ago. There's a lot of action and scenes that remind you of a melange of Agatha Christie s Hercule Poirot reels and Ian Flemings s protagonist and ye olde India from the days of the of the Raj, where the train conductor is a lean Sikh, with a long black beard and a penchant for hypnotizing a snake that belongs to one of the Whitman brothers. The film begins to an old tune I remember by Leonard Cohen Where do you do my lovely. Pure nostalgia for people approaching their fifties and beyond. The song and the scenes with Jason Schwartzman have been cut well to illustrate the text of the song. A wonderful, sensuous prelude to the film with an attractive female, Anjelica Huston. She has blue bruises all over on her body, and says she loves him in a Parisian hotel-room, and he replies in a couldn't-care-less manner. The three brothers jump in and out of the same train, with their 11-piece luggage, throughout the film but what unfurls is a fascinating landscape of rural India and typical characters that you might have read in Rudyard Kipling s books on the Raj. The bigger brother Owen collects his brother passports and tells them to trust him and other spiritual things associated with Indian philosophy. He also pleads to his two brothers that they should be honest and tell him everything. No secrets. But as soon as one of them goes for a few minutes, there s backbiting and inquisitiveness in the air. It s also the story of three sahibs out to discover spiritual India. What might be funny to a Brit or European may seem almost arrogant and forced comedy to viewers in the Indian subcontinent, with its clichis. : a shoe stealing boy runs away with one of the sahib's shoe, a female service lady gets laid willingly by Casanova Schwartzman. Perhaps it was the sweltering Indian summer that made the protagonists do such things. The journey is a pilgrimage to a Sikh and Hindu temple with a lot of tikas and bhajans thrown in. A dramatic river rescue in which an Indian boy drowns and the three sahibs bring the limp body to the villagers is touching. A Hindu funeral ceremony with the father of the dead child washing his son s body, mourning neighbors. Hindu rituals, vedic chants, humble villagers. Then a Hindu village farewell with namastes. Then it s back into the train, like in Michael Ende s Jim Knopf and Lukas, towards India's daily sub-continental chaos and normal madness. The wiedersehen with the meditating mother, a grey-haired energetic lady who feels that she must help the nuns with their charges, than live in London in affluence, turns into a therapeutic siance for family Whitman. The mother suggests to her sons that they should learn to speak without words. It reminds my of Paul Waczlawick saying: you can not not communicate. In German we say: Man kann nicht nicht kommunizieren, meaning thereby that you do communicate, even if don't do it verbally. One communicates non-verbally. Your gesture, your mimic muscles speak volumes. Towards the end the director (West Anderson) works with metaphors by showing each protagonist in a separate train-compartment as it moves on. There are tears in the eyes of the Indian sari-clad train lady, the Sardarji train-conductor plays affectionately with the snakes, which he d declared dead, the sensual lover from Paris is also in the train, as is also the dead Mr. Whitman, alive and kicking. I thanked Anderson for the old melody 'Oh, Champs Elysees' quietly as the film ended and the credits were shown. The songs of the sixties and seventies were a delight indeed. It was 91 minutes of family conflict, a lesson in Family Therapy, carried out in India s fantastic backdrop, snakes and all. It was a declaration of love to India. Life is a long journey, one is given to understand, and when we want to reach our destination, it s easier to get rid of the cumbersome excess baggage. Simplify your life. All those expensive worldly belongings and destructive emotions make our lives difficult because we tend to clutch on them. You can t take your traveller's cheques and plastic cards when you leave this world, for this world is but a maya. An illusion. One thing is sure: the trip is limited to a life-span. I must admit, I watched Darjeeling Limited in German and a lot of English humor was lost in translation, when dubbing. The humor was dry and the situations absurd. I'll get a DVD and watch it in English when I have time.